She was looking for coffee and conversation. He was looking for a quiet place to write. What they found was a connection that would make this Christmas unforgettable. Hayley Wolfe shares a kinship with the lost and lonely. Growing up without a father taught her that you can’t always count on people. Her strong faith in God taught her that her Heavenly Father is unshakable. When she meets Kameron Kohl at her antiques and coffee shop, she’s immediately drawn to his warmth and charm. After being abandoned on the steps of a church as a baby, Kameron Kohl has spent his life rejecting God and meaningful relationships. After all, his own mother didn’t care for him, so why should anyone else. But Kameron never expected to meet Hayley Wolfe. Her faith in Christ, her inner beauty and selfless openness towards strangers, has Kameron falling for her hard. When Hayley notices a connection between Kameron's keychain and the locket passed down to her from her mother, she wants to investigate further. Kameron refuses. As friendship turns to love, Hayley will have to rely on God to soften Kameron’s heart. 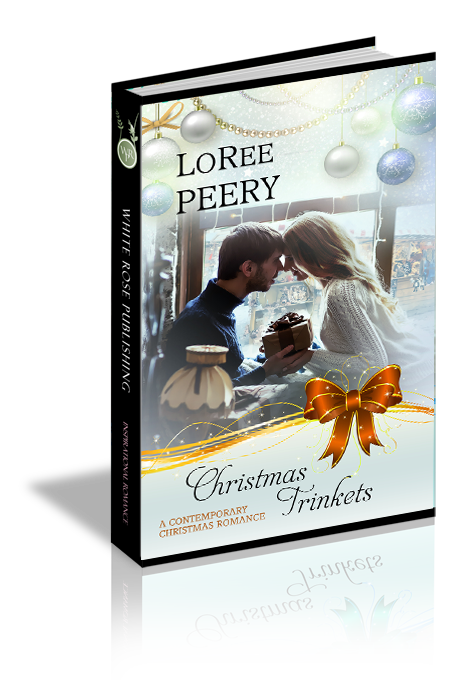 Will the connection between their Christmas Trinkets lead them to love or unanswerable questions? Hayley switched on interior lights and the open sign to Auntie’s Antiquities, and then glanced up at the Victorian replica ornaments decorating the garland that dangled at the edge of the window. Ross Travis, from the garage across the road, approached at the same time as another early bird, who held the door. The stranger gave her a nod and headed for the seating area. Ross flipped steel-gray hair from the corner of his eye and watched steam from the coffeemaker. She switched her attention from Ross to the man who slung his shoulder bag onto the marble-topped parlor table. Men around her age, shy of thirty, rarely came in. He ignored her as she neared with the carafe of steaming coffee. He’d removed his coat and placed it over the back of a mahogany chair with inlaid rose in needlepoint. She suppressed a giggle at sight of the laptop as he flipped it open. No such new-fangled invention had ever touched the antique marble. The man closed his eyes and performed what looked like a ritual, based on the concentrated breathing and shrugged shoulders, followed by immediate dropping of the hands. Wow. Good looking, but preoccupied. Brown eyes. An interesting crooked nose that, no doubt, told a story. Square unshaven jaw. Not classically handsome, but attractive enough to garner a second look. He ignored her, ran his bottom teeth over his top lip, and stared at his computer. His fingers clacked at a fast pace by the time she reached the breakfront. So much for conversation with someone new. Quiet days at Auntie’s turned busy around late morning. Some shoppers still gave old stuff as Christmas gifts. She glanced at her guest again. Hunched over, his fingers flew in a furious manner as though they couldn’t keep up with his thoughts. A glance out the window showed no parked car. If he was having work done at the garage, Ross would have talked to the stranger. Returning clientele drove out from Lincoln, but more often than not, locals breezed through while they waited for work to be done on their vehicles. Someone must have told the new guy about her shop. No way would he have toted a laptop while enjoying the hiking trail and just happened to stop in. Hers had been a rather isolated existence with only her mom around. She’d always believed if a father had been in the picture she’d know more about people and have a broader world experience. The clacking stopped. The writer tapped his foot. Ran both hands through his straw…no, golden-colored hair. He peered out the window, but she doubted he even noticed the open overhead door across the road. The newcomer looked down and glared at his coffee cup as though surprised to see it waiting there. He picked it up and caught her gaze over the rim. It took a second, but a foggy curtain, or daze, seemed to clear. Then he noticed her. “I’ve never met a real author before. May I ask what brings you to Edgewood, Nebraska?” She waited. The dazed expression returned. Had he slipped back into his make-believe world? She read a Huh? in his expression. “Women,” leaked out under his breath. Kameron tapped a knuckle against his mouth, rolled his shoulders into a hunch, and typed away. Cute, but did he ever smile? Carafe returned to the warmer, she picked up a feather duster and went to the front window where motes magically appeared in the sunshine. Shiny speckles caught the light. Hundreds of silver sparkles glistened on the shelf beneath a sparse pine branch she used to display her impulse buy of bird nests. According to the online ad, every true Victorian Christmas tree held a hidden nest for good luck. She’d never believed in luck and purchased the replicas just for fun. Should she leave the miniature antique tractors drowning in glitter of varied sizes? He reached around her and dabbed a circle of silver caught on a tractor seat with a finger and resettled it on a square of midnight blue velvet that showcased an elaborate filigreed garnet brooch. Without permission he spread his hand to pick up sprinkles, and then brushed them onto the velvet. Kameron topped off his mug and sipped as he studied curiosities in one of the white-washed cabinets. For a writer, he had nice muscled shoulders. What a thing to notice. She turned back to the window. It took three minutes to dust over the doll and crib that cradled it, repositioned a replica Montgomery Ward catalogue. She unclipped a nest from the faux tree and sprinkled more silver on a red velvet tray holding costume rings. A shadow creased Kameron’s forehead. His expression was dark enough to make her swallow and slide her gaze away. What did he smell like? It had been a long time since she missed her sense of smell. “If I was into that time period. Speaking of stories…” He gulped his coffee and handed her the empty cup. She ran an eye over his retreating back, and sighed as he resumed his seat. While brushing the feather duster over rims of ruby crystal, her glances strayed to Kameron at the corner table. How long did he plan to stay in Edgewood? Would he return to Antiquities?